Hey, Manaballers. I just have to say that I’ve been needing to give the old Royal Manaball more love, but May has been hectic and everything happens all at once, you know? Short story submissions, Novel releases and formatting, and, as always, editing. Whatever. The work paid off and the tree bringeth me fruit. In my one year of first being published, I’ve had such an amazing experience. Two novels under my belt. Interviews on The Vinny Eastwood and Jeff Daugherty Shows. Interviewed by THEE Maria DeVivo, author of the Amazing Coal Elf (which is soon to be a series of books). A spotlight on the Silver Bullet Sunday, Flash fiction published by the Stephen King of Canada – James Roy Daley, as well as work published in the blog Writing Upside-Down (a big favorite of mine). Need I brag more? Well, yeah I do. The astounding paranormal author Lada Ray, who pens the mighty Earth Shifter series AND it’s ancillary series The Earth Keeper, actually blogged an Author Spotlight on me! It’s so cool. You can read it right here. I can’t find the words to thank her enough! It’s a big highlight for me and I am forever grateful, mainly because she is a visionary and a forerunner of the YA Revolution. 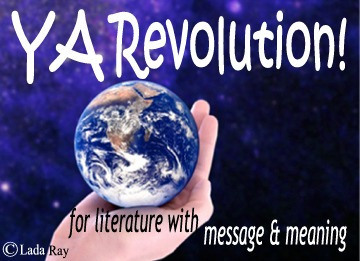 As many of you may know, the YA Revolution is a collection of YA writers who are driving this reader demographic toward the light and away from that trite nonsense which gluts the market (and may bottom it out) this very day. We aim to hold line – by doing something new. Well, I’m going to take the rest of the day off because I need to reboot my brain. You do know that I’m a cyborg? But that’s okay! This entry was posted on May 25, 2013 at 7:46 pm and is filed under Uncategorized with tags Archons, Author, Celestials, James Roy Daley, Jeff Daugherty, Lada Ray, M.C. O'Neill, Maria DeVivo, Review, The Ancients and the Angels, The Earth Keeper, The Earth Shifter, The Silver Bullet, Vinny Eastwood, YA, YA Revolution. You can follow any responses to this entry through the RSS 2.0 feed. You can leave a response, or trackback from your own site.